The path to sustained sales and marketing alignment can be a simple one – simple to do, simple to repeat, simple to remember. All you need is a map. In that spirit, I attempt here to boil down some alignment opportunities for Sales and Marketing leaders. The chart below shows the three main focus areas each for Sales and Marketing which, if approached collaboratively, can improve business results and transform the relationship. Below the chart is a set of definitions, followed by a few examples of how to apply it to your own situation. Value. Since it is almost as costly to close a small sale as it is to close a large sale, Sales professionals would be wise to focus on increasing the potential Value of each sale. In larger organizations, differently skilled teams manage different sized deals. Volume. The more deal flow you can create, the better your chances of growing the customer base, learning from their needs to improve your offering, and improving the company’s financial ability to innovate and fulfill those evolving customer needs. Velocity. Increasing the speed of deal flow can also increase your capacity to sell, grow the customer community, and learn from them to help you innovate and improve. It becomes a flywheel. Content. The more compelling and relevant your content, the more you will attract the audience most likely to benefit from your offerings. Community. The more your content resonates within and among audiences, the greater your capacity to build a community and engage in dialogue to improve sales, products, services, and support. Conversion. The more effectively you convert sales, the more you can learn from customer experience about how to improve your engagement and conversion process. Using the 3×3 chart above, look at the 9 intersecting boxes and ask the questions implied by the two nouns whose paths cross in each box. Example 1: Value + Content. In the upper left intersecting box, where Value and Content intersect, Marketing might ask: How can we improve our Content to increase the Value of each sale? Sales might ask: How can the improved Value of each sale guide us in improving Content? It’s the same question, asked from different perspectives, that aligns your response. Example 2: Conversion + Velocity. 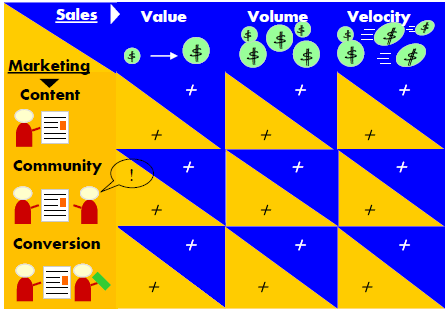 In the bottom right box, where Conversion and Velocity intersect, Marketing might be asking: How can we improve the Conversion process to accelerate the Velocity of Sales? Sales might ask: What sales accelerators can we use as input for improving the Conversion process? See how it works? You may come up with better questions to suit your organization’s culture and challenges. Now, formulate your own questions using the relevant nouns for each intersecting box, turn those questions loose in your organization, and watch what happens. Measuring results with analytics, sales CRM and marketing automation solutions can help you measure and manage your improvement. If you need assistance here, contact us. How’s it working for you? What questions would you ask your colleagues to help you get better aligned? Drop us a comment here; we’d love to hear your feedback! Visit our Resources page for more free strategy tool downloads. There will always be competitors upstream, downstream and alongside your solution offering. Neutralizing three other constant competitors first, however, often spells the difference between receiving an invitation to an RFP bake-off (becoming part of the noise) or aligning as a lasting, trusted inside advisor, effectively closing the door on that competitive noise. Even if you were the only game in town, you still have three competitors: Yourself, your Prospect and Apathy. What steps are you taking to neutralize them? This is the most obvious of the three. Here are a few self-test questions. Are you a student of your own profession i.e. do you invest in your own training and education? Do you fully understand your own offering, the competitive landscape, and your ideal prospect’s latent pain? Are you able to articulate your value proposition in memorable, compelling terms? Are you able to accurately assess and reflect your prospect’s pain, budget and timing? Is your elevator pitch really that good? Are you able to politically align with your prospect’s decision makers and influencers so that they become your champions? Your prospect may be thinking they can solve their pain on their own, or some other way. This is also often called the “build vs. buy” phenomenon. They have already invested in people, process and technology assets; they might be able to re-deploy and cobble a solution from those assets, but they may not have weighed the opportunity cost of solving it on their own. Can you present a compelling proposal showing how your solution will be more cost effective and thereby free your prospect to re-focus their assets more effectively on other priorities to attain greater value? If you understand this, then you are also prepared to defend your reasonable pricing and position it well. Bear in mind, though, that corporate will can be strong; if internal momentum is carrying your prospect toward a “build, not buy” result, you might still cultivate the opportunity as a long term advisory relationship, ultimately helping your prospect succeed. Just remember, you are in sales. Don’t dwell too long on advisory roles if they diminish your long term prospects. Your prospect may indeed express pain but may think solving it is not a priority. Can you present a business case proving that their potential loss in not adopting your solution now is unacceptable, and thereby compel them to buy? You may have to be patient about their own self-discovery process here; you could conceivably work with them to build the ROI case and groom advocates….or, you could help them find a way to redeploy current budget dollars and assets based on the potential savings (short term ROI) of adopting your solution. Have you asked the right questions to gain that level of insight, present that case, and accelerate the sale? What are you doing to neutralize your three constant competitors? Help me in my attempt to boil years of experience into the shortest sales training treatise ever. Have I omitted anything? Could I express it differently? Are there more layers? Of course… but my question is: does this one page article adequately stimulate all that subsequent thinking? You decide, and help me shape it. I welcome your comments.